This new ship is designed for ocean cruising to remote areas and draws on the latest technical advances as well as Coral Expeditions’ 34 years of experience building and operating expedition ships. 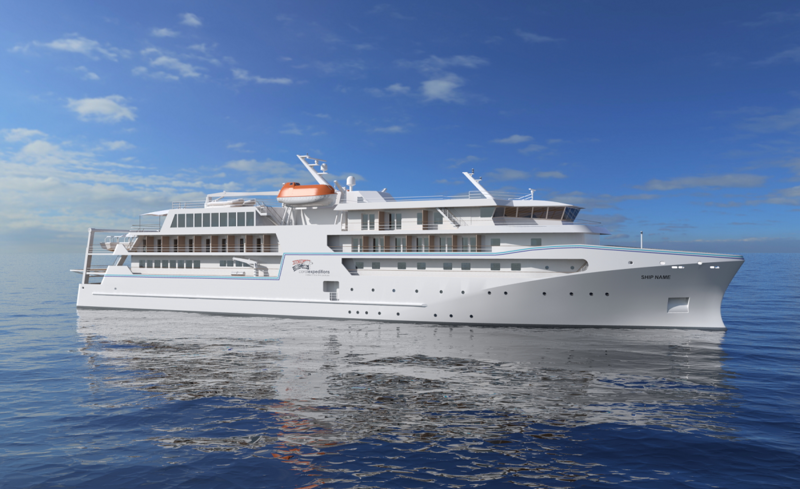 She will carry a maximum of only 120 guests in 60 cabins, preserving Coral Expeditions’ traditionally relaxed and intimate onboard atmosphere with no queues or waiting. Following a long maritime tradition, she will be Australian flagged and crewed, and conform to the highest standards of build quality, operational redundancy and environmental compliance. Vard is a Norwegian-headquartered company with nine shipyards globally and a 70 year history of building complex and sophisticated ships to operate in the toughest conditions. The new ship will feature a modern Australian-designed interior with the colours and textures of tropical Queensland, the birthplace of the company. Accommodations will be restful havens for guests returning from shore excursions and range from outside staterooms of 17 sq m (183 sq ft) to suites of 43 sq m (463 sq ft) with outside-facing bathrooms. She will be equipped with elevators and a gym. Active stabilisers will ensure guest comfort in varied conditions. The new ship order reflects continuing strong demand for the Coral Expeditions product – an intimate and destination-focused cruise experience that stands apart from large ship cruising.